We are so excited to share more of Sarah & Seth’s Lydia Mountain Wedding from this past weekend! Every part of their day was so beautiful and amazing, we are so honored we could be there to capture it all. When we first walked into to Sarah’s cabin, we were greeted by their sweet dog, Zoey! She especially loved Chris! All of the girls and both Sarah’s & Seth’s moms were so fun to hang out with and talk to. There was so much excitement in the air as they were getting ready! Chris had a great time hanging out with the guys, photographing them on the back of Seth’s pickup truck, the usual… haha! Their First Look was one of the most beautiful we’ve ever captured! Not only the location with the Blue Ridge Mountains in the background, but their reactions and emotion! The letters and vows they read to one another were so beautiful and sincere. One funny part that stuck out to me was that they both mentioned Seth falling asleep on the couch in their vows. The reception was filled with so much love and laughter! Their bridal party had so many wonderful things to say about them, and shared some funny memories as well. Oh and the Bride was responsible for the reception decor! Sarah is so talented! I cannot say enough amazing things about this beautiful mountain wedding. Take a look at the photos to see for yourself! 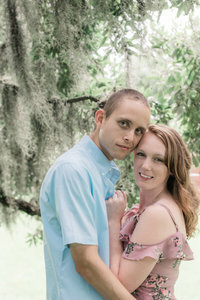 See their Castle Hill Cider Engagement Session!